Published on Tuesday, February 25, 2014. 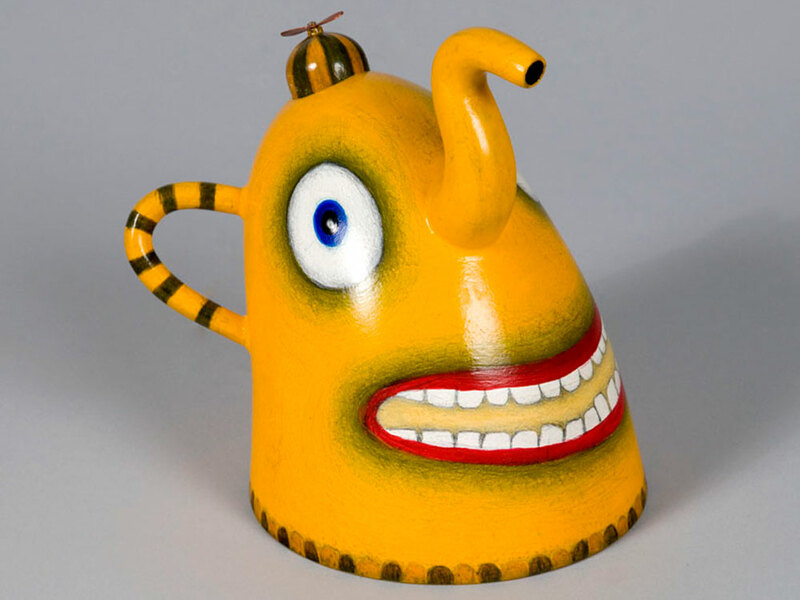 Michael Hosaluk, Self Portrait as a Teapot. Image courtesy of Trent Watts. Join us on March 5 for the first event in our spring Library Salon Series. Acclaimed wood artist and educator Michael Hosaluk will present an overview of his work and current practice. Hosaluk is internationally known for his imaginative voice and innovative woodturning, and his work can be found in the collections of Buckingham Palace, the Minneapolis Institute of Arts, and the Royal Ontario Art Museum, amongst other institutions. In preparation for his upcoming presentation, we had the pleasure of asking Michael Hosaluk a few questions about his work. Read on to find out what he had to say. When did you first become interested in woodworking? How has your approach to the medium changed during your career? I have made things from wood since I was 3 years old. I am constantly looking for new paths and directions, much like an explorer. Humor is not something you necessarily find in a lot of woodworking, yet you use it wonderfully in your pieces. Is this an aspect that you came to through time, or have you always tried to insert a bit of the humorous into your work? I have always had fun with the works I create. Humor for me is another way of saying things to people without offending too much, and that they can relate to in everyday terms. The last piece I did was titled All Wedged, which speaks to exhausting this idea for now. I am sure at different intervals it will show up again. Saying this, I am submitting a proposal for public sculpture that has an element of “Wedge” in it. This project has opened the doors to scaling up some of the concepts I discovered in creating this show. "Wedge Award" will not become annual unless someone else takes the idea and runs with it. There are many worthy candidates. My next project is returning to traditional ideas in furniture making with a few added twists not yet discovered. What are you most excited to present/talk about at the Salon Series event? About my journey as an artist/craftsman. Our work is our history. What is your most-read art or craft book in your personal collection? Ernst Haeckel’s Art Forms in Nature and recently, Rembrandt, The Complete Works. Don't miss our salon - Michael Hosaluk: Artist, Maker, Educator - on March 5 at 7:00 p.m. This event is free and open to the public. See you there!